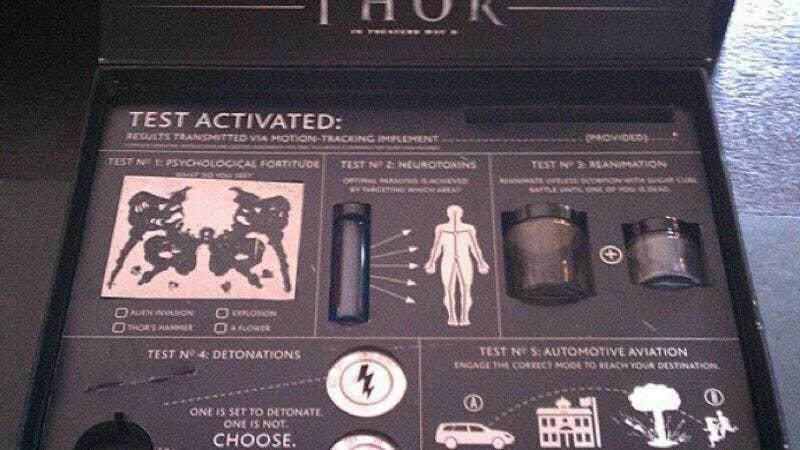 As reported on Automobile Magazine’s blog, each briefcase-shaped box included a number of “tests” that involved toggle switches, mysterious vials of blue fluid, and even the word “detonation” imprinted on it. After a passerby spotted this contraption in the blog’s recycle bin (where the unimpressed Automobile staff had dumped it), they reported it to police who, despite seeing the words “Thor” and “Acura” stamped plainly all over its exterior and interior, and the fact that it was clearly made of cardboard and cheap plastic, began diverting traffic away from the box, and brought in FBI and ATF agents, U.S. Marshalls, and Kevlar-suited technicians to examine it—a reaction instigated, in part, by a bomb threat that coincidentally had been called into a bus station down the street. Obviously this incident is reminiscent of the similar scare caused by the 2007 overreaction to those LED Mooninites created to market the Aqua Teen Hunger Force movie—though somehow even more paranoid, considering the obviousness of the packaging. On the upside, perhaps this will finally sway PR departments to stop foisting the deluge of wasteful swag on writers and just start sending us cold, hard cash.